I Choose You! is an Event Course in Super Mario Maker, released on February 11, 2016. It unlocks either the Bulbasaur, Charmander, or Squirtle Mystery Mushroom costumes, depending on the route the player takes. 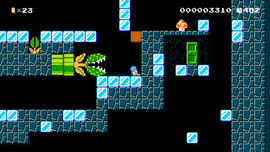 The level begins with blocks arranged to look like Professor Oak's Laboratory, which has a Warp Door that will take Mario to the alternate paths, with Poké Ball block art. At the beginning of each path, block art of the particular Pokémon is shown, along with the appropriate Mystery Mushroom and a warp pipe. The Bulbasaur path consists mainly of beanstalks, winged Piranha Plants, and Piranha Plants on tracks. The Charmander path consists mainly of Fire Bars, with a few Burners placed around the area. Mario can also utilize a Buzzy Beetle to hit a ? Block containing another Mystery Mushroom. The Squirtle path consists mainly of Ice Blocks, Piranha Plants, and Bull's-Eye Bills. All paths lead to a segment with Poké Ball block art where Mario must evade sideways trampolines. It leads to a warp pipe, which in turn leads to another building-like structure made out of blocks, followed by the Goal Pole. This course is based on the beginning of any Pokémon trainer's journey―from choosing your first partner in Professor Oak's lab through reaching the first Gym. Clear the course to unlock a costume of whichever Pokémon you choose! Unlike the original games, it shouldn't be too hard to clear it multiple times and catch 'em all! Soko ni mittsu tobira ga aru jarō! ...... Saa erabe! There are three doors there! ...... Go on, choose! This page was last edited on April 13, 2019, at 11:23.